community and inspire generations to come. Every two years we embrace global unity through athletic competition. Lifetimes of dedication and hard work are captured in split seconds of rigorous achievement. We cry with those who fall short, and we are lifted in the moments of brilliance that lead Team USA to victory. 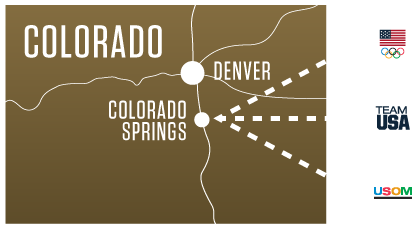 The U.S. Olympic Museum will be located where many Olympic and Paralympic dreams begin – at 6,035 feet above sea level, in the shadow of Pikes Peak – just a few blocks away from the United States Olympic Committee headquarters in Colorado Springs, Colo.
Just a few minutes from the new museum site, the Colorado Springs Olympic Training Center will offer visitors an exclusive, behind-the-scenes look into the daily lives and training regimens of Team USA. With plans for development on 1.7 acres of land in the city's Southwest Downtown Urban Renewal District, the museum will create a stunning gateway to downtown Colorado Springs when it opens in 2020.